Michael O’Riordan – Communist Party (1973 election) | Come Here To Me! Michael O’Riordan (1917 – 2007), International Bridgade veteran and former General Secretary of the Communist Party of Ireland, ran for election six times from 1946 to 1973. His last campaign in 1973, running in the Dublin Central constituency for the 20th Dail, was captured by RTE for their current affairs programme ‘Tangents’, which was broadcast after the main evening news from 1972 to 1974. 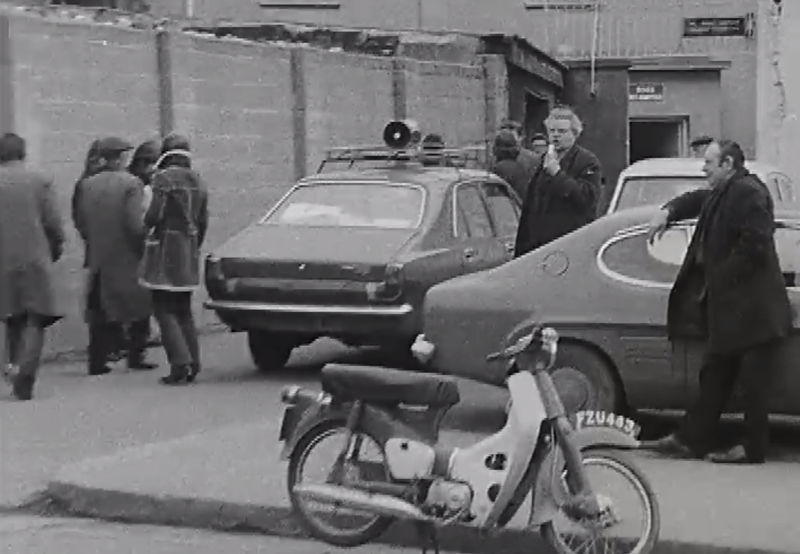 In this short two minute clip, O’Riordan is first seen outside an Unemployment Exchange canvassing people for his vote using a microphone attached to the car. Secondly, in presumably the CPI’s office, O’Riordan is interviewed by John O’Donoghue of RTÉ and is asked about the public’s attitude to the Communist Party and whether more people will vote for him this time around. 0:51 in. CPI offices I assume? O’Donoghue describes the event as “first person to stand for the Communist Party in a general election since the 1930s” but I am confused by this as he had run a number of times in the 1950s and 1960s? We had met on his return from Britain and shared a personal-political friendship. When I stood as a party candidate the help of Luke in his artistic capacity was invoked. We billed our public appearance at the then waste ground across from Christ Church Cathedral. That evening a big audience turned up and Luke performed his overture of working class and national rebel songs. The crowd grew even bigger and then with a rousing finale he stepped back to give the floor to the candidate. I went to the microphone, glancing down to straighten my speech notes, and then looked up to find that 90 per cent of the crowd had evaporated in the wake of Luke. When next we met I greeted him as ‘Comrade Pied Piper of Hammelin’. 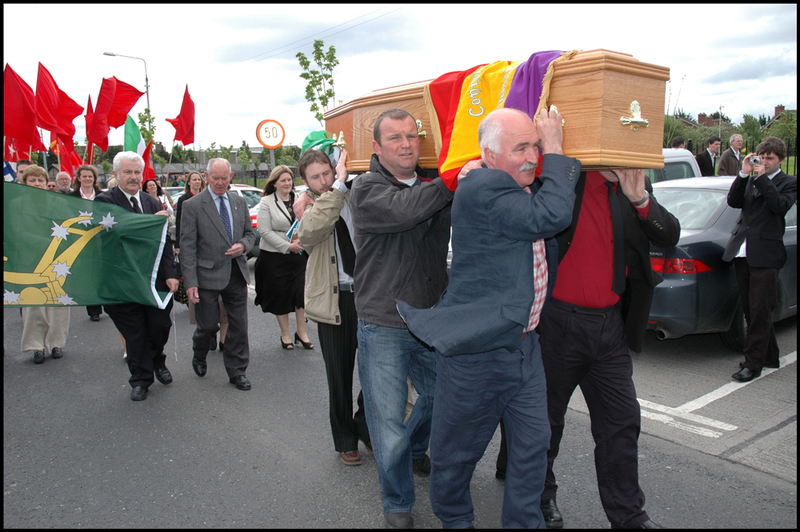 O’Riordan passed away in 2006 and his funeral was attended by over a thousand mourners. Some good stuff about him in elections in the Sean O’Mahony papers in the manuscript collection at the NLI. Also he beat Tom Barry in Cork in a by-election in the forties, can’t remember exact date off hand. I think he says “stand openly for the Communist Party”. Others may correct me but I think O’Riordan may have stood as an independent in previous elections. CPI was not reformed until 1973 if I remember correctly [definitely early 70s anyway] so that might explain it. 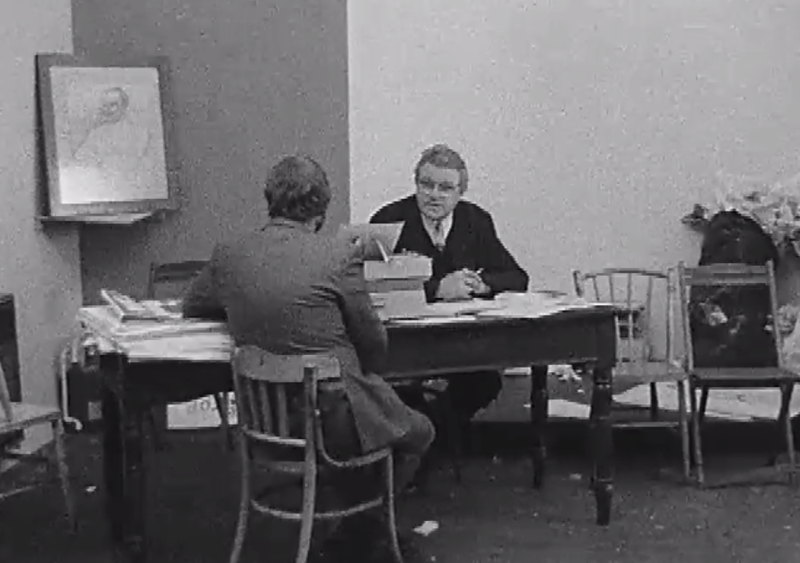 I had a look at Brian M. Walker’s ‘Election Results in Ireland 1918-1992’. In the Cork Borough by-election (14 June 1946) O’Riordan was listed as ‘Socialist’ and came third out of four candidates, Tom Barry being last. In 1951 he’s listed as ‘Independent’, though a member of the Irish Worker’s League, in 1954 and 1961 he’s IWL, in 1965 he’s Irish Worker’s Party and in 1973 CPI. So yeah, technically not a CP candidate until 1973. A bit late on this I know but 1973 was the first election I was able to vote in. In the spirit of rebellion (all my family were FF)I gave my first preference vote to Michael O’Riordan along with 465 others.